Christmas festivities will soon be here but don’t feel daunted, our friends at the Scrapstore have some great ideas for Christmas decorations and Christmas gifts. 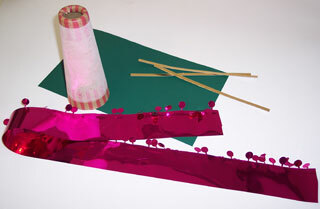 Here is just one of their lovely Christmassy craft-makes, to keep the kids busy for a while! 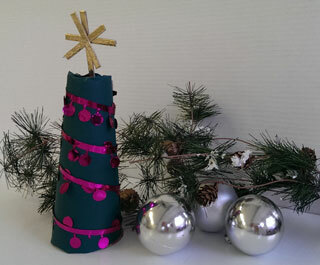 Cover the cardboard cone with the green paper and glue in place. Decorate the cone with sparkly bits. Cut three short pieces from a gold/silver card strip. Glue at the top of one gold/silver card strip to make a star. Pop the star down the centre of the cone and you have your finished masterpiece! You'll find lots more Christmas craft ideas on the Scrapstore Pinterest page, including an advent calendar, Christmas decorations and present wrapping ideas. There’s something very special about making something to give or share with your family and it’s a great way to keep costs down. Children love to contribute and willing hands will be at the ready if given half the chance. At the Scrapstore you'll find every you will ever need to make and create some wonderful Christmas crafts. They've even come up with some gorgeous gift ideas for you to make. The Scrapstore, run by the Gloucestershire Resource Centre (GRC) is where clean and re-usable waste materials collected from companies are offered to community groups and families. It’s a little like going to the supermarket, only it’s a lot more fun, as it’s your imagination that you’re shopping for! An annual Family Membership (£7 a year) will allow you to 'shop' at the Scrapstore for all those occasions that crop up, including holiday times when the cost of trips and outings can be too much. You can find out more about the Scrapstore, located in City Works, Alfred Street, Gloucester, including opening times, by visiting their website.